As much as I love FAIRIES these cute little witches were a refreshing change to make! 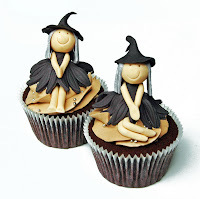 These are two from the 40 Fondant Witches made for a little girls 5th Birthday Witch Disco party. Chocolate Fudge Cupcakes with Cadbury Milk Chocolate Buttercream, yummmm. The cutest witches I have ever seen! These are so adorable! they're little pieces of artwork! i love all of your cake designs, you have a real talent and artistic flair. i hope that one day i can learn to make cakes as beautifully as you do. absolutely goregeous!